Are you an LGBT Youth? 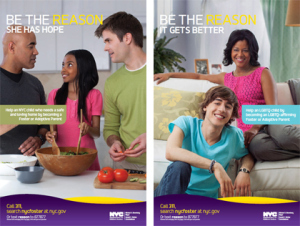 New York City’s child welfare agency wants more gay and lesbian foster parents. The Administration for Children’s Services is launching a campaign to expand the kinds of families who consider fostering and also to find welcoming homes for children who identify as lesbian, gay, bisexual or transgender, The Wall Street Journal reported. As WCBS 880′s Alex Silverman reported, the ACS said there is a disproportionately high number of LGBT foster kids and teens. She said the ad campaign recruiting not just gay and lesbian couples but LGBT-affirming parents is badly needed. The executive director of the Lesbian, Gay, Bisexual & Transgender Community Center said many gay New Yorkers don’t realize that the city allows them to become foster parents. Peter Decaro and Kevin Leavy of Brooklyn became foster parents to a 2-year-old girl and a 17-month-old boy in December. Decaro said he can’t imagine life without them. The center will hold an event Thursday for prospective parents where they can speak with children in the care of foster parents and discuss the process of becoming foster parents with agency representatives. PFLAG Support Group meets on the First Monday of the month Back at UUCA! PFLAG Atlanta is a 501(c)(3) registered non-profit organization. We are 100% volunteer-run and member and donation financed. We are not affiliated with any religious or political institutions.